Jocelyn in front of her ride! Jocelyn worked at one of the most popular rides in Walt Disney World! I actually fell in love with this ride even more when I did my program. It reminds me of home and it was really nice to ride it whenever I was feeling homesick. Here's what Jocelyn had to say about her experience! I was an Attractions Cast Member at EPOCT in Future World West on the ride, SOARIN’ during my Fall CP of 2011. Well you often got one of two shifts. You either got the early morning open, which meant you had to drop the rope (which they don’t do anymore I heard, super sad cause that was always fun) at 6am and tended to work till about 5pm. Or you came in around 12 pm and closed, which was normally around 11pm unless it was EMH shift, then you wouldn’t get out till at least 2am or later. Most of your days were about 10 hour shifts (or more, as the FTs and PTs were always trying to give away short shifts) unless you could get ERs, which were unlikely as Coordinators tended to give them to FT or the dying. Holidays were different, especially New Year’s where we had everyone on deck for almost 24 hours (this was before the Extra Disney Day events). But unlike anywhere else, our ride had the most “clopens” I have ever heard of, where you barely met the 8 hours between shifts before getting double pay- though some lucky few scraped through. It actually wasn’t, even though now I couldn’t picture anything else I would want to do. I actually was desperate to be a Photo Pass Photographer and even after I found out I was Attractions I wanted a Spieling role like Jungle Cruse Skipper or Great Movie Ride. Ironies of ironies had me land at Soarin’ because when I went to Disneyland in middle school, Soarin’ was the one ride I didn’t get to go on (because my family didn’t tell me and I went shopping instead) and they held it over my head for years. So of course the universe made me basically live on that ride to make up for lost time. 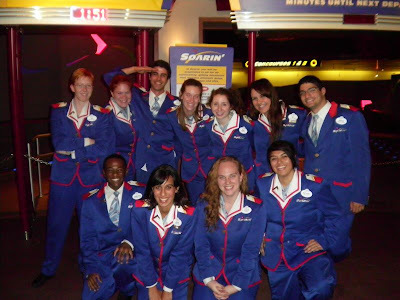 Jocelyn with her Soarin' co-workers! For the ride itself, I loved EMH shifts. I am naturally a night owl, so being perky late at night was not a problem for me. We did have a Pre-Flight Spiel we had to do and I loved every moment of it and it made up for not being a Skipper, kind of. But Tower had to be the best. Seeing everyone’s faces and listening to them as they experienced the ride was amazing and thrilling knowing that as Tower you were the first line of defense if the ride broke or something went wrong (which it hardly ever did as that ride was automated through the teeth). As for my program as a whole, Holidays were both the good and bad parts of my program. Because I did the fall program I got to hit all the major holidays in the parks, which was good because that was when I had the busiest schedule. I drowned myself in work because I would feel the homesickness any time a holiday hit, as this was the first time away from home. I did have days off and got to attend the Holiday parties, both Hallowishes and Christmas, several times because I took shifts on the actual holidays and got some of the lesser attended days off. I loved being in the parks during those times. To see everything decked out and all of the characters in their special outfits. LOVED IT! The downside was that guests, who already have a bit of a warped sense of what cast members and Disney could do for them, would get even worse. Especially during Food and Wine or the Marathons. This is a particular problem rides in Epcot face that many of the others don’t, in which Guests drink around the World Showcase and then get on Soarin’, which unfortunately ended in more Medicals than I would hope. But if there was anything that I particularly hated, was our bus ride at the end of the day. Epcot has all of the ICPs and not many of them understand the concept of a line. So you may be standing in the queue and under normal circumstances be like 4th on the bus, but after they mob the bus (which there never are enough of) you have waited for 2 more before you can actually get on, even then its standing room only. So if you can in ANY WAY bring a car, room with someone who has a car, or even bribe someone with a car- DO IT. That’s actually how I met one of my best friends on and off the program. Because Soarin’ is the mainline attraction at Epcot, almost all of the celebrities that would come for the holidays made their way through Soarin’ at one point or another. Now most of them would have their GR and come in through the VIP entrance, but others would sneak up on you and catch you off guard. While they were filming the Christmas special, Justin Beiber came through and caused a huge issue because it also was the same time as the Cheer National Championships so I literally had a ride full of middle school and high school cheerleaders… and Justin Beiber in my carriage. Oh was that loud, and unpleasant for the both of us as I am not a fan and let him know as “subtly” as I could. But my favorite was when I was taking a picture for this family and Santa came through the line. Now he was a card-carrying Santa and was giving out gifts to the kids in line. Now, I am a HUGE fan of Christmas and Santa was my ultimate celebrity- even though I know he’s not real, so I geeked out over Santa and he gave me a picture of him with his Reindeer (real ones too!) and then got on the ride. Well, right as it takes off a Make-A-Wish family comes through the VIP Entrance and their little boy asked me what I had in my hand. I showed him and the kid got so excited that I gave him the picture and when the ride ended asked Santa if he could take a picture with the child, which he did. When Santa asked where my picture was (he saw the kid already had one) and found out I had given mine away, Santa then gave me a bell off of his sleigh (to which I stopped talking and just grinned like an idiot and the child start laughing, knowing exactly what it was) and gave me a wink when he realized that was my favorite story ever. The rest of the day I jingled with his bell in my pocket, wishing everyone a Happy Holidays. That bell brought more smiles that day than the rest of my program and was the perfect culmination of Disney, Cast Members and Guests all believing in the magic and will always hold a place in my heart. My best friend and roommate had done it the year before and had gotten Mission Space Attractions, and was headed back again. So I decided to give it a shot and try as well. I thought it was a long shot because I was a History major and not Theater, Hospitality or Business like everyone else, though I did have theater training having lettered in High School. But they actually loved that about me and was one of the reasons they decided to hire me. Plus, having been a huge 90s kid the chance to work at Disney was too hard to pass up. is still a COLLEGE program, so there is a multitude of personalities and priorities that won’t always mesh up with your own. My big example of this was I was added to a group of girls at the last minute on a roommate match up group on facebook, about 2 weeks before the program started. They had a girl drop out of their group and had seen me on the boards and knew I didn’t have a roommate. I agreed to join them, but in hindsight had wished I had left it up to the Housing lottery. Nothing is harder than breaking into a clique and I ended up moving out 3 weeks later. My second group was better, but they had still all had time to bond and get to know each other, so I was on the fringes. BUT! That also drove me to try and meet as many people as I could. I went to the mixers, signed up for a bunch of classes and even talked to people on the buses (which is harder than you think) and most of the time people are super friendly. Even better is your area begins to become your family, squabbles and all, and you will make lifelong friends even if it doesn’t seem like it as times. Its 2 years later and though I never did another program I am headed back to WDW this September to visit my friends that I still talk to daily. At the time your record card might not seem like it’s very important, but if you want to have an enjoyable program keep that sucker clean. Especially if you have plans past your CP with the company. It is all too easy to call in, show up late or slip up and the points add up fast. I saw many a good CP fall prey to this and get termed, which is one of the most humiliating moments of your life (don’t let anyone say any differently). Furthermore, if you plan on doing a PI or want to move up, network from the very beginning and at all costs EXTEND. Almost every single one of my friends who left their program without extending ended up not getting their PI of choice, if they got one at all. 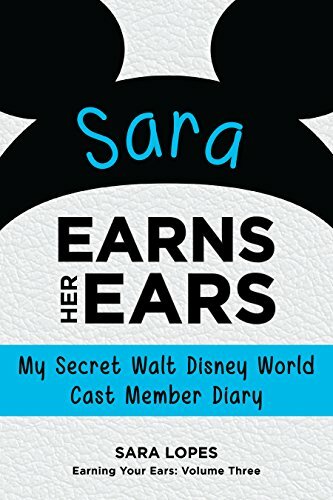 I know they say you don’t have to have previous Disney experience to apply to those, but if you are in front of their face it is much easier to make that transition. Also, DON’T BE AFRAID TO NETWORK! Everyone at Disney is ready to help you succeed and if you want to shadow someone, just ask. I ended up in meetings with Entertainment Managers, Event Operations VPs, Tradition Coordinators and more just because I shot them an email and asked. Some of the best work and career advice I have ever gotten came out of those meetings and I am still in contact with some of them, even though we have long since parted ways. It never hurts to try and sometimes opportunities you could never imagine arise from a simple conversation. DO IT!! Don’t hesitate, just go for it! Yes, it will have its ups and downs and there will be times when all you want to do is quit and go home, but the good times are so amazing that you can’t even begin to describe it. You will make friends and memories that will last a life time and flood your Facebook to the chagrin of those you left at home. CPs is like a giant fluffy mob of awesomeness that you need to dive in head first to enjoy. If you would like to contact Jocelyn for any questions, you can reach her on her blog joeliz713!